A small package, wrapped in a brown paper mushroom bag arrived for me from Eugene, Oregon the other week. Inside, thanks to my friend Linda Schindler, was vanilla salt. She said the people that make it promise it will change your life. Unsure whether I wanted my life to be changed, it’s been on the shelf in the kitchen, winking at me since like a gateway salt. But I knew what I wanted to use it for, and just needed a little time to unleash the magic. It was either going to be cod or salmon with vanilla beurre blanc, and I chose the salmon so I could crisp and char the skin for crunch. Vanilla and fish is nothing new, The French Laundry is known for it’s vanilla poached lobster. And on the island of Comoro near Madagascar, it has been a combination since the 1890s. Still, it’s not that often seen on menus here in London, at least not in the kind of places I eat, which admittedly are these days more likely to be a cold shipping container in a car park on a rare date night, or our local Indian ‘street food’ canteen with the children. Although, how something can be called street food when you eat it inside at a table under a roof and in a room is beyond me. When summer wheezes it’s way over the horizon for ten minutes this July and the barbecue is dusted off, hosed down, thrown away and a new one bought, a pan of this vanilla infused butter sauce will be on standby to pour over the grilled lobsters or langoustines. For now, I’ll content myself with burning charring the salmon skin and the onions on the cast iron griddle for that smoky flavour. The first time I had fish with beurre blanc I thought I’d never eat again. And to an extent, I don’t think I’ve had a more memorable dish since. It was like a scene in a ‘6os parody after smoking a jazz cigarette. Angels started gently singing and the world melted into the swirling background. How could food taste this good? We were at Brasserie des Cappucines in Paris, a large family lunch for my Great Aunt’s 85th birthday. It was one of those historic meals where you even remember how amazing the loos were. And in three weeks time, we will be off again to celebrate her 100th, although God only knows where we’ll be going this time, I imagine we’ll be eating at the Elysée Palace or on top of the Arc de Triomphe. One is not often 100 years old. The rich sharpness of this most simple sauces suits the sweet, flaky and creamy texture of fish; it’s the most elevated comfort food, so simple to make yet so luxurious seeming. In essence, it’s just hot vinegar and cold butter. I used tarragon vinegar and the finely chopped stems of the onion flowers as the base for the beurre blanc, finishing it with a pinch of the vanilla to give it the extra luxury. A little cream would turn it into beurre Nantaise if you fancy a little more richness. And cooking the salmon seasoned with the most gentle of vanilla twists, the heady aromatic comes through without being overpowering. It’s a little like a cuddle from Yvette Carte-Blanche in the cellar of Café Artois. But listen very carefully, I shall say this only once: salmon must be cooked medium rare. You can make your own vanilla salt by scraping the seeds into the salt and mixing it well. Chop up the pod a little and throw it in then leave, sealed for a few days to infuse. It goes equally well into caramel as it does onto salmon. Heat a griddle pan to foundry level furnace hot and season the salmon all over with the vanilla salt and let it sit for a few minutes before cooking. This will help firm it and stop the proteins leaking out and forming unsightly white bits. Reduce the vinegar by three quarters in a saucepan with a handful of finely sliced onion stems. Slowly whisk in the butter, a little at a time until it’s emulsified and smooth. Taste and season. Keep gently warm until the fish is cooked. Cook the salmon skin-side first until its crisp, then flip it over and cook for a minute or so more until slightly translucent in the middle. Leave to rest while you char the onions on the griddle. 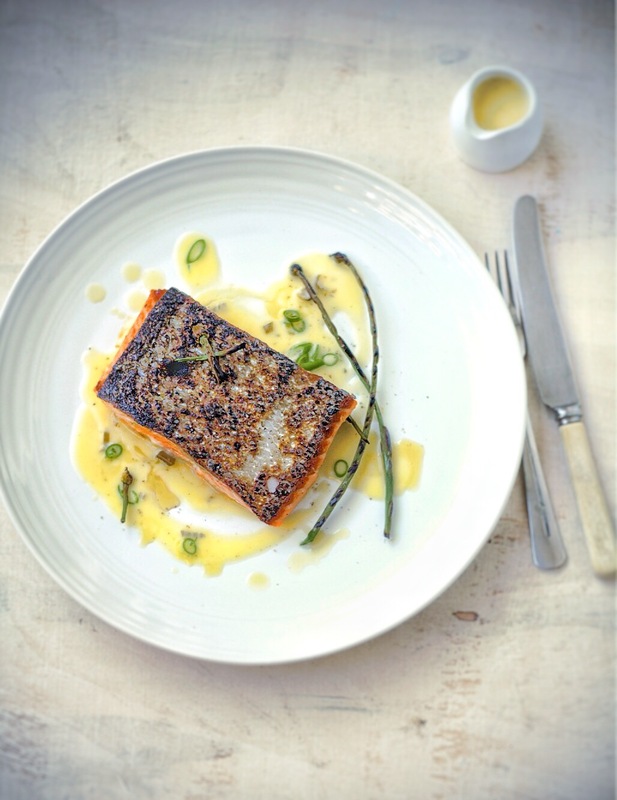 Serve the fish with the onions and beurre blanc, a final little twist of the vanilla salt accompanied with a Jerusalem artichoke gratin or purée.